The running costs of all Baker Perkins Accurist™ dough dividers can be reduced simply by fitting new design dies. Oil consumption, waste and downtime are all reduced by the patented new design while reduced dough build-up improves weight control, extends cleaning intervals and prolongs die life. The improvements have been achieved by reducing the contact area between the die and the machine by 50%, along with a self-cleaning feature that disposes of dough passing the die face rather than allowing it to accumulate. 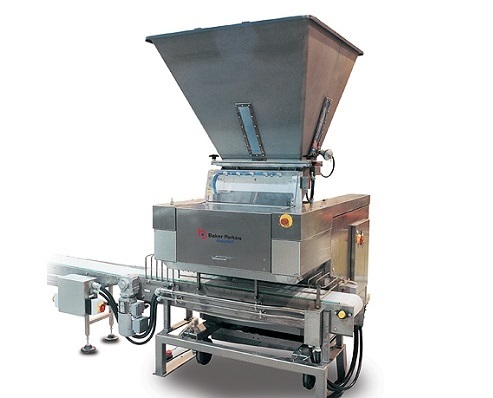 A reduction in the number of difficult-to-clean recesses along with easier and more secure handling makes the dies easier and faster to clean. The new die is fully interchangeable with the previous one and is compatible with all Accurist™ and Accurist2™ dividers. Performance of the current range of Accurist2™ dividers has been further enhanced by the introduction of a ram and knife with more efficient oil distribution that improves operation and extends component life. The new parts are lighter for easier handling and reduced risk of damage during cleaning. The Accurist2™ divider delivers best-in-class weight control, low stress dough handling and low cost of ownership in high-output plant bakeries. It retains the consistent Accurist™ scaling accuracy – an industry standard for more than 20 years with more than 650 machines at work throughout the world. An outstanding Standard Deviation of just 2.5 to 3.5 grams is maintained on 900g dough pieces over 10,000 hours of operation without any parts replacement. Depending on the number of pockets chosen, output can range from 840 to 14,400 pieces per hour; and piece weight from 175 to 2,500 grams.